Marillion’s Mark Kelly suffered four broken ribs after he was hit by a truck while out jogging in Germany over the weekend. 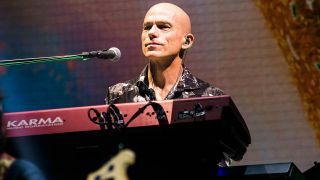 As a result, the keyboardist was forced to miss the band’s show in Essen last night – but he'll be back onstage with Marillion in the city for tonight’s performance. His Marillion bandmates later issued a statement, saying: “So we have an eventful day today. Whilst out on his morning run, Mark Kelly was hit by a truck. He was taken to hospital where they discovered he had four broken ribs. “As you will see in the video, the hospital wanted to keep him in overnight for observation. We collectively took the decision that 'the show must go on' and put together a half acoustic/half electric show with our friend Riccardo on keys for the last few songs. Marillion have several more shows across Europe planned throughout the remainder of 2018 and will return to the UK next year for further dates.